Throughout the remarkable twenty-two-year career of the Ramones the seminal punk rock band, Rock ‘n’ Roll Hall of Famers, Recording Academy Grammy Lifetime Achievement Award winners and inductees into The Library of Congress' National Recording Registry, Monte A. Melnick saw it all. He was the band’s tour manager from their 1974 CBGB debut to their final show in 1996. Now, in this NEW UPDATED EDITION he tells his story. 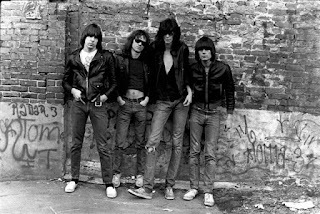 Full of insider perspectives and exclusive interviews and packed with over 250 personalcolor photos and images; this is a must-have for all fans of the Ramones. Your forgot to mention the key thing here. Johnny ripped the guitar riff directly from David Bowie's "Hang On To Yourself". I say this as a big Ramones fan - but give Bowie his due. i concede you are correct, that is the clear source of one of the principal riffs. at some point i hope to re-edit and include this detail (several have pointed it out to me elsewhere). thanks for reading.